Sony Corporation ('Sony') announced today that it developed a super-flexible 80 μm-thick 4.1-in 121 ppi OTFT*1-driven full color OLED display which can be wrapped around a thin cylinder. 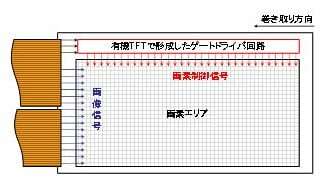 To create the display, Sony developed OTFTs with an original organic semiconductor material (a PXX derivative) with eight times*2 the current modulation of conventional OTFTs. This was achived due to the development of integration technologies of OTFTs and OLEDs on an ultra-thin 20 μm thick flexible substrate (a flexible on-panel gate-driver circuit with OTFTs which is able to get rid of convetinal rigid driver IC chips interfering roll-up of a display) and soft organic insulators for all the insulators in the integration cuircuit. By combining these technologies, Sony successfully demonstrated the world's first OLED panel*3 which is capable of reproducing moving images while being repeatly rolled-up - around a cylinder with a radius of 4 mm - and stretched. Sony will unveil the results of this development on May 27 at "SID (Society for Information Display) 2010 International Symposium" in Seattle, WA (May 23-28). Sony will proceed with the development of the solution / print based process which manufactures display devices from organic materials that are easily dissolved in common solvents. This process requires fewer steps, and consumes materials and energy more efficiently - thus has a smaller environmental footprint - compared to the conventional high temperature vacuum semiconductor process which use inorganic, silicon materials. Sony will continue to improve the performance and reliability of its flexible organic displays because the application of these developments are expected to yield thin, light-weight, durable and mobile devices with enhanced form-factor. 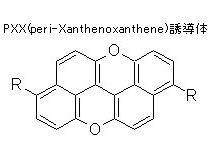 Sony has developed organic semiconductor material, peri-Xanthenoxanthene (PXX) derivative, which is stable under exposure to oxygen, moisture, light and heat and improved current modulation of eight-times*2 that of conventional OTFT with organic semiconductor of pentacene. Improvement of this OTFT achieved the world's highest-resolution OTFT-driven OLED display with resolution of 121 ppi and 432 x 240 x RGB (FWQVGA) pixels*4. This is the world's first demonstration*3 of an OLED display with an integrated gate-driver circuit with OTFTs. The improvement of the OTFT described above enables integration of a flexible gate-driver circuit with OTFTs on a display panel. The roll-up capability is possible because the rigid driver IC chips has been removed from the display. In order to enhance flexibility of the display, Sony has developed organic insulators for all the insulators in the OTFT and OLED integration circuit. These organic insulators can be formed with the solution process in the atmosphere which is requires fewer steps, and consumes materials and energy more efficiently - thus has a smaller environmental footprint - compared to the conventional high temperature vacuum semiconductor process which use inorganic/silicon materials. The OTFT-driven OLED display with the aforementioned technologies (1-3) can reproduce moving images while rolled-up around a cylinder with a radius of 4 mm. Even after 1000 cycles of repeatedly rolling-up and stretching the display, there was no clear degradation in the display's ability to reproduce moving images. *1An OTFT (Organic Thin-Film Transistor) is a thin-film transistor with organic (carbon-based compound) semiconductor. The OTFT can be directly made on a flexible substrate at low temperature below typically 180°C. It has high mechanical flexibility and therefore it is expected to realize thin, light-weight, mechanical-shock resistant and form-factor enhanced electronic devices, such as flexible display, e-paper and RF-ID tag. Because organic materials can be easily dissolved in common solvents, development of electronic circuits in a large area with solution/printed process has been attractive much attention. *2Internal comparison between OTFTs with pentacene (C22H14) and OTFT with a PXX derivative. The OTFT with a PXX derivative shows hole mobility of four times higher than of a OTFT with pentacene and better switching performance, resulting current density at a certain gate voltage of eight times higher than conventional pentacene OTFT. *4World's highest resolution in OTFT-driven OLED displays on May, 2010, based on Sony research.